ASA style is generally used by sociology. It features parenthetical citations and an alphabetized list of references at the end on a page titled References. Entries for the Reference page must be alphabetical and double-spaced, with the indent of the subsequent line one-half inch from the left margin. 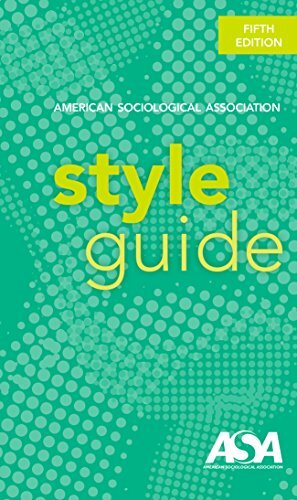 The most recent style guide for ASA citation can be found in the Reference Stacks on the 2nd floor of the library. ...in another study by Duncan (1959). ...whenever it occurred (Gouldner 1963). Note: This is the preferred ASA style. Older forms of text citations are not acceptable: (Kuhn 1970, p. 71). ... (Martin and Bailey 1988). If a work has three authors, cite all three last names in the first citation in the text; thereafter, use et al. in the citation. If a work has more than three authors, use et al. in the first citation and in all subsequent citations. ...had been lost (Carr, Smith, and Jones 1962). If a work cited was reprinted from a version published earlier, list the earliest publication date in brackets, followed by the publication date of the recent version used. Separate a series of references with semicolons. List the series in alphabetical or date order, but be consistent throughout the manuscript. ... (Green 1995; Mundi 1987; Smith and Wallop 1989). Lastname, Firstname. Year of publication. Title. City of Publication: Publisher Name. Lastname, Firstname. Year of publication. Title. City of Publication: Publisher Name. Retrieved Date, (URL). Lastname, Firstname. Year of publication. "Chapter Title." Pp. #-# in Title of Book. City of Publication: Publisher. Bursik, Robert J., Jr. and Harold G. Grasmick. 1993. Neighborhoods and Crime: The Dimensions of Effective Community Control. New York: Lexington Books. Thomas, Jan E., ed. 2005. Incorporating the Woman Founders into Classical Theory Courses. Washington DC: American Sociological Association. Retrieved December 12, 2006 (http://www.enoah.net/ASA/ASAshopOnlineService/ProductDetails.aspx?.productID=ASAOE378T05E). Lastname, Firstname. Year. "Title of Article." Title of Journal. Volume (Issue):page numbers of article. Lastname, Firstname. Year. "Title of Article." Title of Newspaper/Magazine. Month Day, pp. page numbers of article. Lastname, Firstname. Year. "Title of Article." Title of Journal. Volume (Issue):page numbers of article. Retrieved Date (database name). There is no space between the colon and page numbers of an article. In the case of a newspaper or magazine, the volume and issue information is replaced with the month and day. The year of publication is still placed immediately after the author, regardless of the type of periodical. Aseltine, Robert H., Jr. and Ronald C. Kessler. 1993. "Marital Disruption and Depression in a Community Sample." Journal of Health and Social Behavior 34 (3):237-51. Menon, Nivedita. 2009. "Sexuality, Caste, Governmentality: Contests Over 'Gender' in India" Feminist Review 91:94-112. Retrieved November 2, 2010 (http://proquest.umi.com). Author. Year. "Title of Article or Webpage." Place of Publication: Publisher. Retrieved Date (URL). American Sociological Association 2006. “Status Committees.” Washington, DC: American Sociological Association. Retrieved December 12, 2006 (http://www.asanet.org/cs/root/leftnav/committees/committees).